Eating Like a Tenement Family: So What Have We Learned? 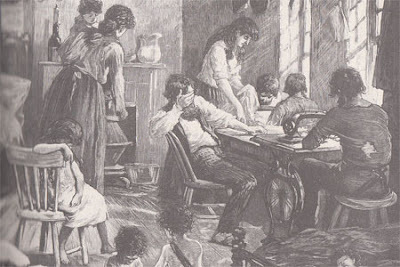 Illustration: “Homes of the Poor,” Harper’s Weekly. I ended up spending close to $20, and consumed about 800 calories a day. Rethinking it, the cost does fit with Corson’s projected budget: $60 would not be spread equally in a family with children of varying ages. $20 is intended for each adult, and the remaining $20 would be divided amongst the children. However, I spent $20 to slowly starve to death. I lost a total of 3.6 pounds over the course of the week. I’m certain my weight loss would eventually plateau: women’s bodies are notorious for locking in fat during starvation crises. She is really good at cutting to the quick. And the question has been posed often recently: How much does it cost to eat well in America? Buy potatoes, onions, and rice in bulk. It’s cheaper, and you really can’t go wrong. From now on I’m going to buy bakery bread as opposed to it’s commercial counter part. The loaf I bought this week was twice as big and half as expensive. Even my roomates agree: Macaroni and Cheese is delicious in any century. I’m glad I revisited this 19th century recipe. Also, Polenta is great. Baked or fried, with veggies or cheese, I’m going to incorporate it into my diet. And it’s so cheap, it’s practically free. I’m also going to start saving my soup stock. After make soup or stew, the juice at the bottom on the pot is good stuff. It’s flavourful from hanging out with all those meats and vegetables. I’m keeping it, and throwing some rice or barley in there, and eating it again. The apple I had wasn’t necessary to keep my bowels moving; the beans etc. had plenty of fiber, and I was very regular. After a few days, even my desire for fresh produce wained. All I wanted was a quick source of calories: I craved bread, butter and milk, exactly what Corson recommends buying. UPDATE: I also had some fresh pineapple. I returned to my pre-tenement weight in one day. Now I pose the same question to you: What have you learned? Additionally, some of you have been asking me if I am going to do a part two, either by doubling my budget or eating some sort of “modern” tenement meal. What would you do as a sequel to this project? Saw you on NY1. This is SUCH a cool project. Enjoyed reading all about your experiences. You should do a lecture at the tenement museum! Thank you, Kristin! I work as an educator at the Tenement museum, and also do food history work with them. So perhaps in the future! I came across this whilst trying to learn what havoc I’m about to wreak on my body by finally putting my money where my mouth is and spending the next 3-6 months (or until I lose so much weight that my doctor deems it a health hazard) living on the 800 or so calories per day that was allotted to the Jews in the Warsaw Ghetto. I’m not restricting myself in terms of what foods I eat (which is partly because I hate both potatoes and onions and those made up the vast majority of their diet and partly because I have no great ambition to actually starve myself to death, so protein is a crucial component here), so I doubt I’ll ever be suffering through tripe, but this was still a fascinating thing to read. I’m not looking forward to the crankiness by any means. Are you blogging? Can I follow along? Fascinating! At the insistence of a friend, I am. You can follow it here: http://800intheghetto.wordpress.com. Thanks!